On December 1, 2013, VoiceQuilt will close. It’s been an amazing journey. We’ve collected 400,000 voice message toasts and memories that have been delivered as gifts, touching thousands of lives. Along the way, we’ve received endorsements from the TODAY Show, CNN and, even, President Obama. We’re proud of the work we’ve done, delivering thank you messages to U.S. troops and “I love you” messages to people celebrating birthdays, anniversaries and other occasions. 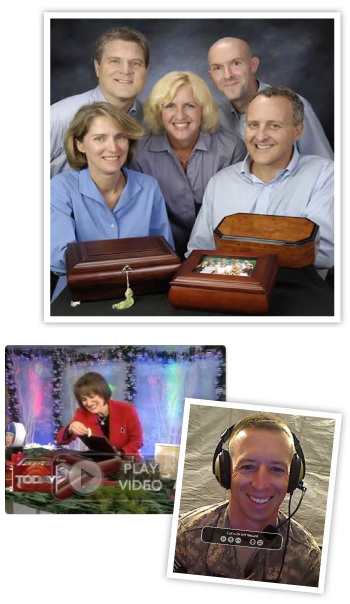 Most of all, we’re touched and inspired by the thoughtfulness of VoiceQuilt gift givers. It’s been a great journey. However, it’s time for us to move on. Before December 1, 2013, anyone who has ever created a VoiceQuilt can download their voice messages for FREE. After then, VoiceQuilt will no longer be available. We’ve helped thousands of customers create unique, memorable gifts. However, our business model isn’t sustainable. Someday, gift givers will customize keepsakes by clicking a button that streams voice messages (and maybe even video) instantly. We’re just not there yet. Technology costs are still too high. VoiceQuilt is closing December 1, 2013. We urge all customers to download their voice messages for free before then. What happens to my voice messages after VoiceQuilt closes? After VoiceQuilt closes December 1, 2013, voice messages will no longer be available. Can I order a VoiceQuilt Keepsake Gift? Certainly! Just log in and click “Finalize Your Playlist and Check Out”. A screen will appear where you make your Keepsake selection. We will ship your VoiceQuilt Keepsake via UPS no later than the next business day. Last Day to order is Saturday, November 30, 2013. How do I download my VoiceQuilt? It’s easy. Just follow the instructions for downloading VoiceQuilt messages as a single file – or as individual mp3 files below. Many VoiceQuilt gift givers want to download their VoiceQuilts. There are two ways to do this: download the entire VoiceQuilt MP3 (similar to a podcast); or download each VoiceQuilt message as an individual MP3 file. Your VoiceQuilt will appear as a single MP3 file, MyVoiceQuilt.mp3, in your default download location. If you’d like to download each of the voice messages individually, that’s easy, too. Once a voice message appears in your VoiceQuilt Message Center, you can click on the "download" icon to the right of the message to download that MP3 for free to your computer. You can also share your VoiceQuilt by email at any time for no additional charge. Your email recipient can click on a sharing link that takes them to VoiceQuilt’s Sharing Center. There, the entire VoiceQuilt can be downloaded as a single MP3 file or each voice message MP3 can be downloaded individually. Downloading VoiceQuilt messages is handy if you’re in rush. Many gift givers burn their own CD of VoiceQuilt messages and play it on the way to a family celebration. Others download the voice messages and use them as the soundtrack for a photo show or video montage. In short, you’re in control. 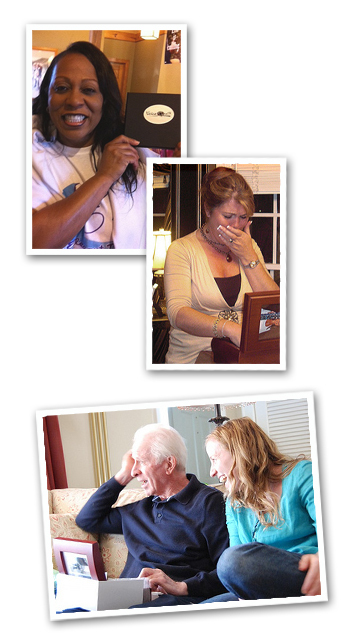 Our goal to make it easy for families to celebrate loved ones with voice message toasts and memories. How you share and enjoy those precious voices is up to you! How do I move messages into my VoiceQuilt? - click on the green “Description” field to re-label the messages. Once you get all the messages just the way you want them – in order, re-labeled – click "Finalize Playlist and Check Out". A screen will appear where you make your Keepsake selection. We will ship your VoiceQuilt Keepsake via UPS no later than the next business day. How do I email my VoiceQuilt? 4) Enter the email address and then customize the body of the email. Can friends call in from outside the US? The toll-free number for the VoiceQuilt message system can only be reached by calls originating within the United States and Canada. However, we provide several options for overseas callers. Any applicable long-distance charges will be assessed by the caller’s local telephone provider. How do I invite friends to record a message? 3) Record your message, just as if talking to an answering machine. 4) Press # to hear more options or just hang up. Please note that when you use VoiceQuilt’s invitation system, each unique email address will be assigned a unique Invitation Number. How do I remind friends to record a voice message? You can click on “Manage Invitations…” then right-click the “To” button and highlight “Invitees that have not called”. This will populate the “To” box with the email addresses of the folks who have not yet recorded a message. When will my VoiceQuilt ship? The map below shows normal UPS Ground Delivery time in Business Days. Please be sure to add one extra business day for your VoiceQuilt to be created. For example, if UPS delivers in two business days, if you order on a Sunday, we will create and ship on Monday, UPS will deliver by end of day Wednesday. Note: Saturday is NOT a Business Day. © 2013 VoiceQuilt™. All Rights Reserved. Portions protected under U.S. Patents 7,634,068 and 7,903,797.